People don’t say “Thank you” enough. I don’t say thank you enough. Stopping to acknowledge something someone has done for you makes the world a kinder and better place, but in the face-in-a-screen, rush-around society we live in, we seem to have lost this. So I want to take this time to say a huge THANK YOU to all those people who supported our team in the ski-a-thon we participated over our March Break. We far surpassed our goal and did it in lightening quick time. You are amazing. Our team – The Deane Machine – was a big hit. 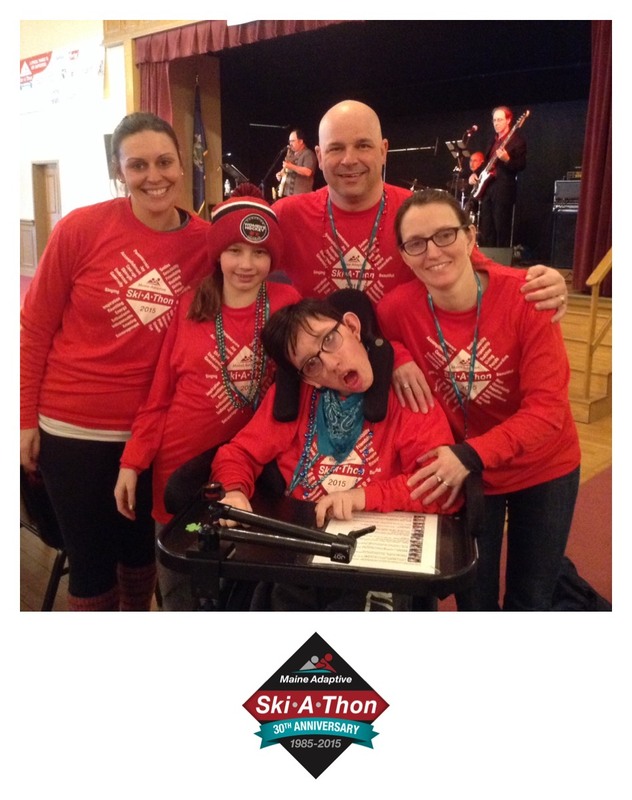 Our decision to participate, three days before the ski-a-thon, was a way for us to say “Thank you” to the fantastic people at Maine Adaptive Sports and Recreation. For seven years, they have helped us enjoy a family vacation that has become a highlight of our year. The reception we got from volunteers who have skied with us, from organizers and from members of the board was overwhelming. I’m not sure if they’ve ever had a ski-a-thon team from Canada before, but when they caught a glimpse of the large maple leaf on my husband’s back, they made a point of saying how much they appreciated us participating. They were amazed that we drove 10 hours to come to their resort and that we had been doing it for seven years. They were glad we had decided to extend our vacation for an extra day – our daughter’s birthday no less – to participate in the ski-a-thon. They couldn’t get over how much money we had raised so quickly – thanks again to our friends and family. I have written before (Where people know your name) about the impact Maine Adaptive has had on our family. It was their equipment, their know-how and their attitude that showed us that we could have fun altogether as a family. In fact, if Deane weren’t in a sitski and clearly having so much fun, we probably wouldn’t ski together. We’d all being going in different directions. It was humbling to have so much attention paid to us. Staying an extra day to ski was a way of stepping out of our busy lives for a truly worthy group of people. Thanks to all of you for helping us say thank you to an organization that has given us so much.